A bicyclist was rushed to Harborview Medical Center with life-threatening injuries after being hit by a King County Metro Bus in Seattle Monday morning. According to KOMO News, police received multiple reports of a bicycle-versus-bus collision at the intersection of South Jackson Street and Rainier Avenue South, near Seattle’s Central District, just after 8 a.m. 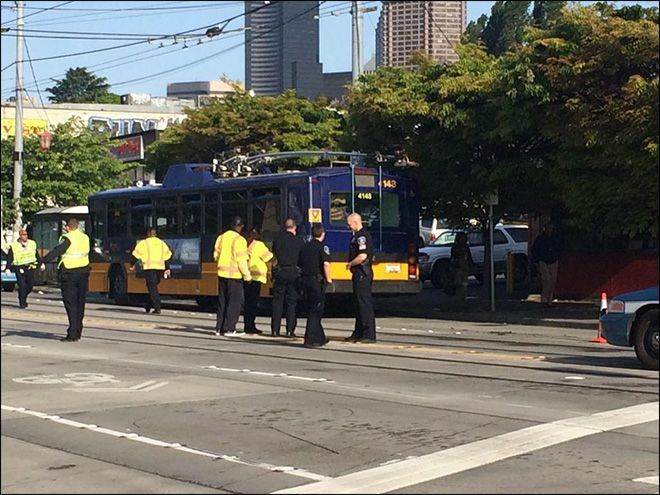 When they arrived at the scene, officials found a male bicyclist in his 20s who had been struck by a 40-foot Metro trolley bus. Investigators found that the bus and bicyclist were both traveling westbound on South Jackson Street and that the bicyclist was riding alongside the bus. Witnesses told investigators that the bicyclist somehow lost control and was then struck by the bus. One witness told KOMO that he witnessed the bicyclist scream in pain when he was hit by the bus and fell into the street. From a legal standpoint, the ability to establish liability for this collision will depend largely on the initial investigation into the crash. Since police and medics were called to the scene immediately after the collision occurred, there shouldn’t be any issues locating witnesses or collecting relevant evidence from the scene. As you can see in the photo to the left, the bicycle lane markings at this particular intersection are arranged in an almost awkward weaving pattern. It may seem random at first, but the design is intended to allow bicyclists to cross over the trolley tracks at a perpendicular angle, so that the tires do not fall into the grooves of the tracks and get stuck. According to KOMO’s story, investigators are already looking into the possibility that the bicyclist’s tires got stuck in the tracks before the crash occurred. If this is the case, there is a chance that the city could be held liable for the victim’s damages. The city has a duty to point out potential hazardous or dangerous areas for cyclists. This leads us to the idea of “shared lane markings.” These are visual cues to help drivers and cyclists interact with one another. First, there are “sharrows.” These markings make it clear to both cyclists and drivers what portion of the road they must allot for one another. It’s more of a best practice for cyclists to adopt. You might see some of Seattle’s bike lanes are highlighted with a green color. These green zones are areas where cars and bikes use the same part of the road when switching lanes. It’s like an exclamation mark for your attention. Finally “bike dots” are manhole-sized images of a bike rider showing cyclists what direction to stick to in an intersection. These are printed on the asphalt to reduce visual clutter along the margins of the street.